Jim’s sixth grade classroom looks like a jungle. While our tropical plants spend the summer in the gardens, at least half of them ask to go to Jim’s classroom for the winter. His students learn how to care for rubber trees, hibiscus bushes, peace lilies, and a sea of begonias. They hand in papers through a gap in citrus and succulents, aloes and steadfast geraniums. It takes a truck to bring all the plants to school for the winter and it takes the village of his school to savor all their gifts. One tree towers about them all in both its height and its magnificent outpouring of love, a tropical beauty called Dombeya Wallichii. This beloved Flower, a native of Madagascar, is all about sheltering love. When it blossoms, the immense orbs of pink Flowers flood the air with the most unusual perfume of baking cake. This year, as you know, Jim’s school is in the chaos of reorganizing itself to face the present economic situation. Not only do Jim’s kids wallow in the tropics all day, but all the staff meetings- and there is one every day- happen in Jim’s classroom too. Everyone meets in a consoling sea of Flowers, under the sheltering branches of the Dombeya Wallichii. Because Dombeya Wallichii Flower and Essence are all about sheltering love especially for caretakers, silently pouring out love to students and teachers alike is a natural for this Flower. And this year, recognizing the particular circumstances in play, the Dombeya Wallichii responded with an immense Flowering. Instead of the usual couple of blossoms, it has thrown off over twenty orbs of Flowers, huge balls of exquisite pink. And the perfume wafting down the halls? 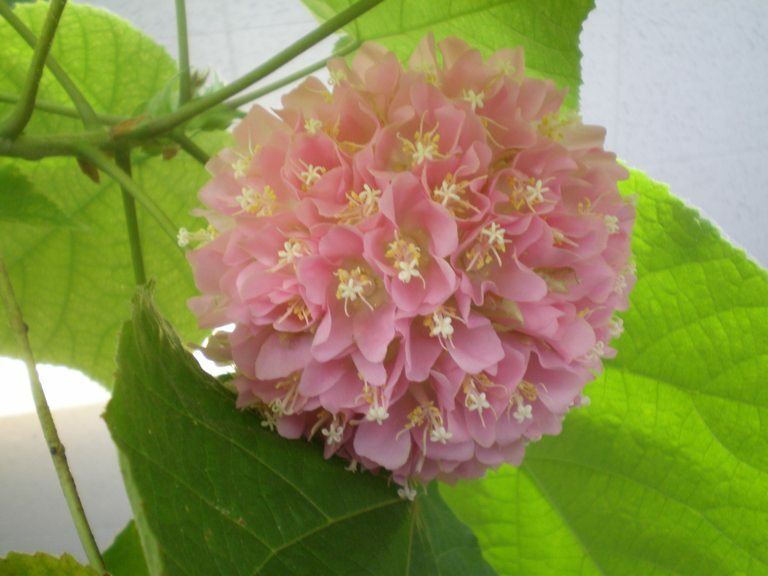 While Jim has invited everyone in the school to visit his classroom to enjoy Dombeya’s display, everyone would have found their way there anyways, following the irresistible scent of this ravishing Flower. Diving into the scented heads for a deep breath, each and every visitor is graced with the vibration of this loving presence. Such a reminder to me of the grace of Flowers and their fine tuned love for each of us.